Cool & Creative Ways to Use Your Muffin Tins! 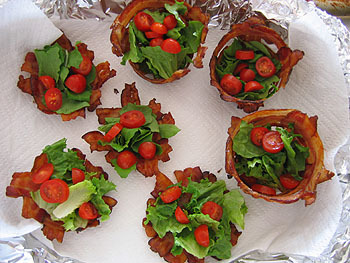 So today I have for you a way to go breadless with your BLT in a muffin tin! You can also make bacon nest salads with this cool bacon trick! I first came across THIS picture on Pinterest… of a Bacon Nest Salad from lil sugar.com. Preheat oven to 400 degrees. Cover the back of a jumbo muffin tin with foil and weave bacon strips around the backs. Be generous with the bacon — it will shrink and leave gaps in your cups. Set the pan in a cookie sheet with a rim to catch the dripping fat. Bake for 20-30 minutes or until crispy, checking occasionally for oven fires. Wait for it to cool before removing the foil and shaped bacon, then carefully transfer bacon cups to a paper towel-lined plate. Fill with your favorite type of lettuce, tomatoes and a mayo-based salad dressing to really fill out the BLT. You can really get creative with the dressing and even your greens so go ahead and explore! You may notice that there are 2 different types of cups or baskets pictured. You REALLY must click over to her blog not martha to see all of the pics and what she uses to make them. You can pretty much use any type of muffin tin depending on what shape you are going for. For the bacon lovers of the world there’s no shortage of bacon cooking ideas on the internet, but I found that I personally LOVE the idea of weaving it into baskets or nests. You can put a salad in one of those little bacony nests, fill them with Swedish pancakes and douse it all in syrup, you could even dip them in chocolate and serve ice cream inside!! The possibilities are endless! As for me I will stick to the BLT or salad nests 😉 But I hope you are inspired to try something new. Be it with your muffin tins or bacon or both!